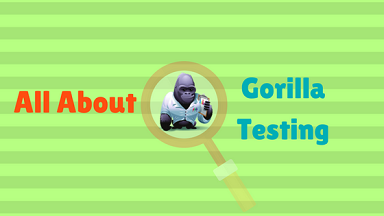 What is meant by Gorilla Testing? Each and every software has to go through many big and small tests before it can be released. Achieving the final product is a collusion of intensive work and extensive testing. One part of such exhaustive testing is known as Gorilla Testing. Testing each portion or module of a software to its breaking Point is known as Gorilla Testing. In other words, every minor code of the software is tested until it starts to fall apart or fails to give the desired results. Often due to the brutal nature of this testing technique, it is also known as Torture Testing or Fault Tolerance Testing. Each module of the final product is picked one at a time and tested with a range of valid and invalid inputs. These inputs are not always pre-determined, in fact, they are random in nature. They are used until such a time that the results break the acceptable tolerance level. Simply speaking, in Gorilla Testing repetitive manual testing is done progressively to test the robustness and capability of the software application. The idea behind Gorilla Testing is to satisfy even the most erratic software user. Time Consuming :Testing is always a time-consuming task as it cannot be carried out at a frantic pace. This tends to cause delays in the software release date and sometimes by the time a new and well-tested software enters the market, there is something new brewing on the horizon. Expensive :When it comes to technology, time is money. Any delays mean more cost. Tools Not Readily Available:The biggest drawback of Gorilla Testing is that there is no one comprehensive tool that can be used to perform this task. It is best conducted manually, but in doing so one can easily overlook little things. Ensures Functional Capability :A well-tested product from all angles is always more successful. The Client and developer can both breathe easy in knowing its full range of functional capabilities. After all, a fully functional software with no discrepancies will reap more profits than a product that is unable to tolerate even small deviations. Satisfies The Most Errant User :Human mind tends to work in different ways. As such, even those users who are most doubtful and erratic in feeding inputs will be pleasantly surprised. The purpose behind Gorilla Testing is to ensure and validate the fact that the final product will still perform within an acceptable range even with the data that the most errant user supplies. Ensures Positive Response :When every aspect of the software is tested to know its tolerance level, it is easy to determine what sought of response or feedback it shall garner. Gorilla Testing is one step forward in collecting a positive feedback for the final product. It is always wise to know how far a software can be stretched before it gives way under pressure. Gorilla Testing accommodates this need of the developers by providing an insight into its breaking point. This gives a chance to the developers to tighten the loopholes in case they are unacceptable. Ultimately, Gorilla Testing is a play of strength. You may also like our next article on monkey testing.